While preparing for the job interview, most people focus only on the questions they will face. They try to prepare for each question and figure out a good answer. Your attire, your non-verbal communication, your mindset, the documents you bring to the interview with you–all of that plays a role in the interview. All of that will have some impact on the final outcome of your meeting with the hiring managers. What else should you include on your portfolio? Only a few people think about creating a portfolio, or about bringing it to the interview with them. Statistics I collected while running a recruitment agency reveal that less than five percent of job seekers did actually bring the portfolio to the interview. A mistake? A chance missed? Portfolio is more in-depth than a resume, and it explains your education, skills and abilities, working experience and achievements, in a simple to understand yet attractive and professional way. For creatives, it often stands for a collection of their best works. The two most common forms of work portfolio are either an online version, or a paper form. Each of them has some advantages, and you can actually have both at the same time. Nowadays, when it is easy to make a website (think WordPress, Blogger, Drupal, or even specialized portals for creatives, such as PortfolioBox.net) you can create a nice and professionally-looking portfolio in a few hours. Online portfolio makes it easy for you to link to your best works in your job applications (job applications are also submitted online). If you are not tech savvy, however, it can be tricky to make it in a right way (beautiful, meaningful, and at least somehow unique). What is more, not all employers have experience with the portfolios, and some may even ignore the link to the portfolio, though you included it in your job application. When you have your best works on paper, it is easy to show the portfolio to the interviewers. What is more, you can leave them a copy for their consideration, especially if you didn’t manage to show them the portfolio during the interview. On the top of that, leaving them a copy (or even original) of your portfolio is a great excuse for a follow-up call. You will call them to collect your portfolio, and, just by chance, you will use the opportunity to ask them whether they still consider hiring you. If the answer is negative, you can at least use the call to get a valuable feedback on your performance, trying to understand the reasons why they chose someone else for the job. If you are working as a chef and applying for a job of a chef, you can include recipes of your specialties, recommendations from the restaurants where you have worked before, training certificates and inspection reports. (Tasting samples of your specialties is a must for anyone hiring a chef.) You can include also your chef certificates, and anything other that demonstrates your cooking skills. If you are construction worker, you can include photos of the buildings you have worked on during construction and close ups of your construction techniques, a list of projects you have worked on, records that illustrate your ability to meet deadlines and maintain high levels of safety, as well as your training certificates, diplomas, etc. If you are a web designer, you can include pictures of the websites you designed, describing the key functionality and a goal you had in mind while designing each particular website. Of course you should choose your best works only. A nice video on YouTube will tell you the answer. You do not necessarily have to include everything the lady recommends, but you can include any item from her list, and the video will definitely give you some ideas. Pay special attention to the quality of paper and to the design. Portfolio demonstrates not only your working experience and achievements. It also shows us your sense for detail, your marketing and communication skills. It tells us a lot about you. Do not leave your portfolio to the interviewers, unless you plan to collect it back. Show it to them and then take it with you. The best portfolios are pieces of art, and in an ideal case you will have an online version of your portfolio, one you can refer to if they want to check your best works later. Try to make it simple, not more than 15 pages. Try to avoid having too much text, rather include more pictures. It is the visualization that matters. If your portfolio has 100 pages (I saw a few portfolios that big), nobody will remember the first page once they look at the last one. An excessively long portfolio is acceptable only when you apply for a position in top management–in such a case they will pay attention to every detail. Try to make it unique. Do you have any special ideas for creating your portfolio? What about including one page that declares your future professional goals? And what if these goals do “accidentally” relate to the job you try to get, or to the goals of your future employer? This was just one idea. Do not hesitate to come up with more ideas! Portfolio can definitely help you to succeed in an interview. People are visual beings, and to see your best works is completely different than to just hear about them. It is better, and the emotion is stronger. 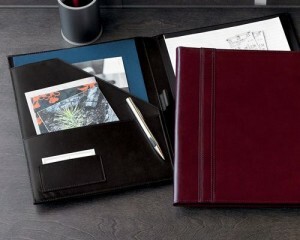 What is more, a portfolio also serves as a reminder of what you have done and achieved in your professional career. Such a reminder will help your self-confidence, which will subsequently help you to do well in an interview. Present your work in an interview with PowerPoint – Alternative to the portfolio is a PowerPoint presentation. Learn how to make it and present it in an interview. Interview success package – Great answers to all difficult interview questions. Learn how to make a great impression and ace your interview.